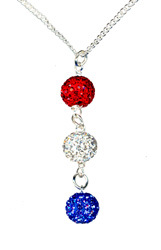 Made using coloured Shamballa Style Beads matching your Country's flag. Support your Country's athletes. Simply made with basic Jewellery Findings such as head pins, eye pins, bead caps and jump rings.